This fall is all about texture and the experimentation of mixing it in various ways. Jason Wu crowned himself the mix master of fall when he paired everything from crinkled satin with silk, wool, leather and fur (all in one look at times). However, combining so many fabrics is no easy feat, but I do believe it is one that you style mavens should make an attempt at. This particular look is a miscellany of materials that are anchored by cotton and denim. Oh, and a pair of snakeskin sneakers that I have not been able to take off my feet since they arrived at my doorstep. The trick to this styling technique is to keep the pieces in a unified color palette. I, like Wu, chose a neutral color palette to experiment with. However, if you have a penchant for bold hues you can take note of how Prada paired technicolor shearling and silk organza in an interesting and fashion-forward manner. Either way, be sure to keep it all in one color range and most importantly, have a little fun with it. Love this look Miranda those Mango trainers are fab & I just love the tweed in your baseball jacket. Fabulous jacket. I would wear this in a heartbeat! Love the mixed media jacket! Gotta love a good mixed media jacket! 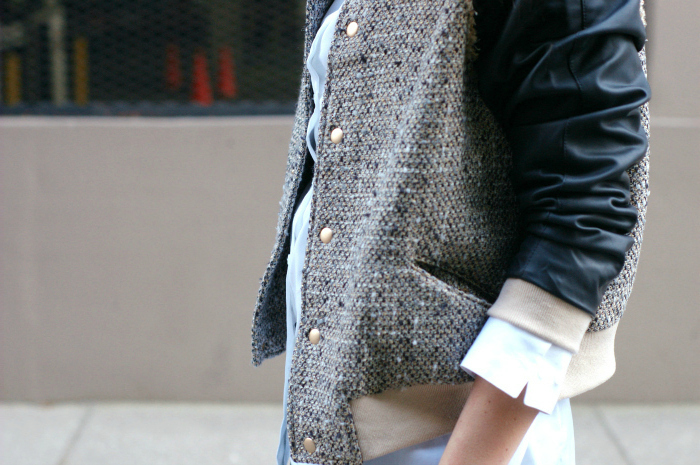 Those snakeskin sneakers are high on my wish list and love them paired with the jacket! love this downtown casual look! super cute!